YES! Send me STRICTLY SLOTS at up to 60% off the newsstand price. 1 year (12 issues) STRICTLY SLOTS for $24 plus 12 issues of Strictly Slots Digital—FREE. That's a 49% savings off the single copy price! I'd like to order 2 years (24 issues) of STRICTLY SLOTS for only $37. That's a saving of 60% off the single copy price. Savings based on cover price of $3.95. 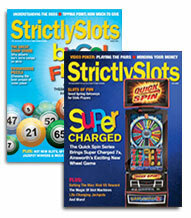 STRICTLY SLOTS is published 12 times per year.